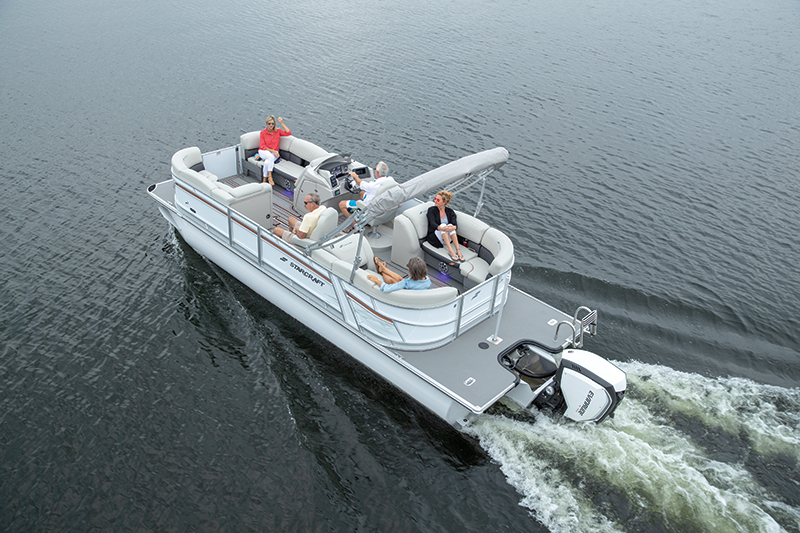 The best-selling pontoon in Starcraft’s lineup just got more attractive for 2019 with the addition of the SP Appearance Package, which changes the look inside and out. The outside features white fence panels that are overlaid with silver anodized rails that have an orange upper stripe and a silver lower stripe. But the gray painted tubes might be the most unique feature. That theme is carried on board by gray furniture with orange panels and a Bimini top with the same color palette. Even the snap-in Marine Mat flooring gets the same orange-and-gray treatment. Buyers who opt out of the SP Package still get a choice of eight fencing colors with black rails. One of the things that makes the Starcraft SLS 5 SP so popular is its impressive performance. No two-tube, life-in-the-slow-lane package is available. Every SLS model includes the HMX Performance Package, which features drag-reducing aluminum underskin, triple tubes (a PR 25-inch center tube has specially placed Performance Strakes on both sides) and an integrated 60-gallon fuel tank. The outer tubes get Performance Strakes on the inside only, which gives it, as we discovered during our test, the ability to turn in a ridiculously tight radius while leaning inward like a runabout. The HMX Package helps this near-26-footer perform well with less horsepower than its 300 hp max. 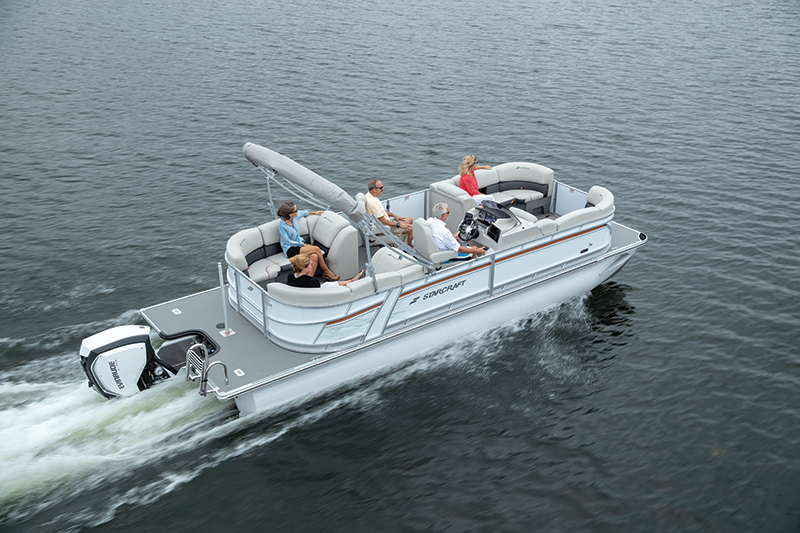 Our test boat featured an Evinrude E-TEC G2 200 hp direct-injected two-stroke outboard that pushed it well. On plane in 2.7 seconds, the SLS 5 reached 30 mph in 8.2 seconds and hit a top speed of 37.3 mph. The Starcraft SLS 5 SP comes ready for watersports with a standard removable ski pylon and Sea Weave flooring on the ample swim platform, which offers better grip. When the skiing and swimming are done, participants can change out of their wet suit in the standard changing hoop. 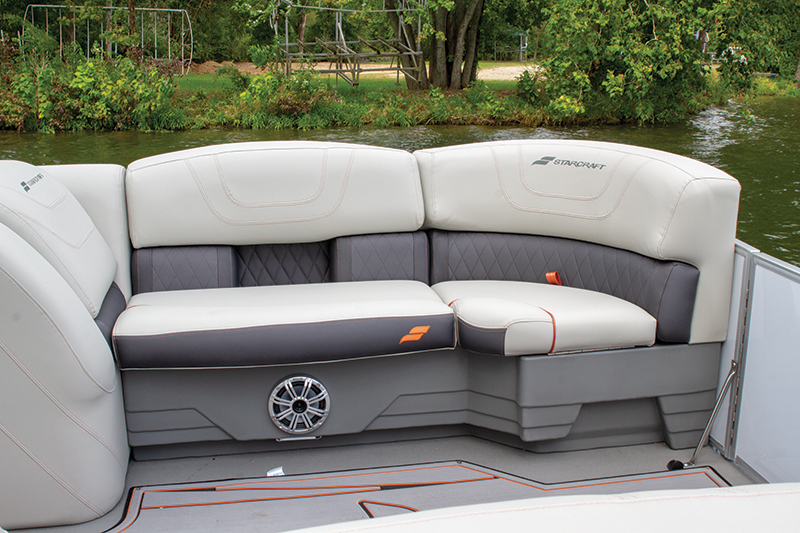 The same basic symmetrical layout — twin layback couches fore and aft and twin captain’s chairs — is used on all SLS (Sporty Lounger Series) models. 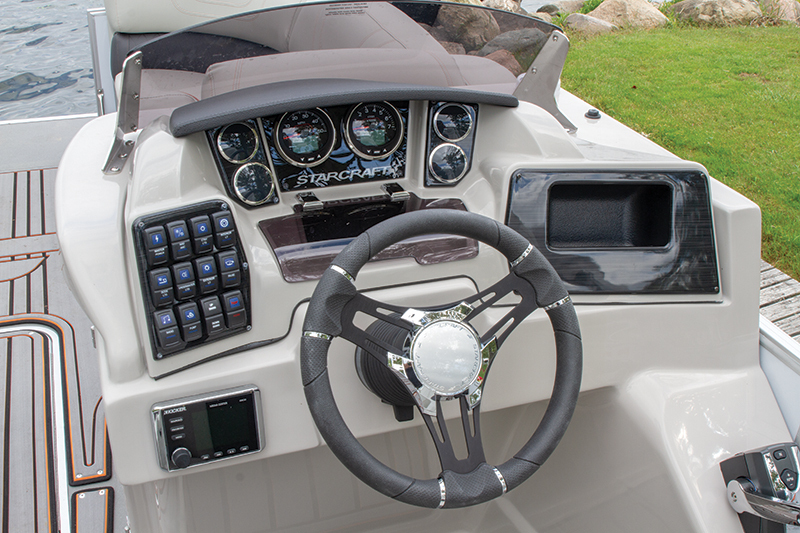 This year, a portside console option has been added and the helm has been updated with a lower windshield, better gauge placement and space for buyers to add flush-mounted electronics such as a Lowrance HDS 7 GPS/fishfinder display. 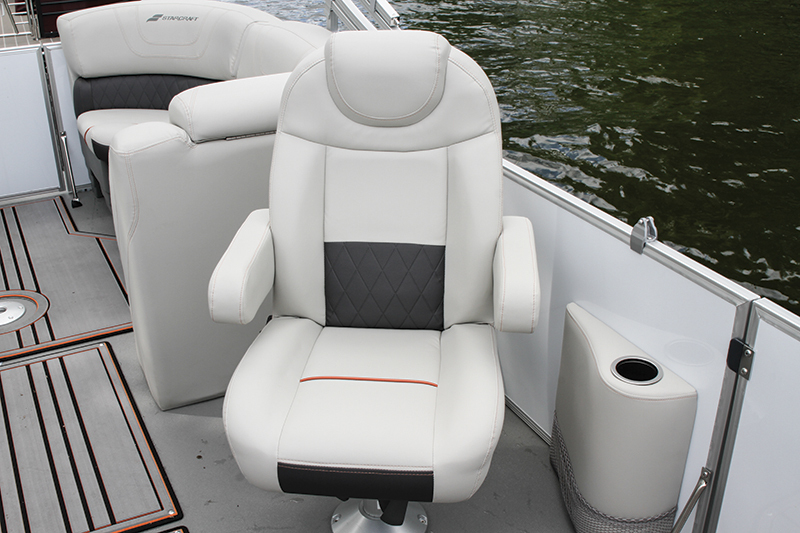 Only a few options are needed to take this pontoon to its max potential: a second cockpit table, in-floor ski storage and upgraded synthetic teak flooring. LOA: 25 ft., 10 in.